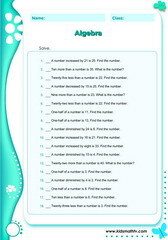 Math worksheets on pre - algebra, children from 3rd to 7th grades, primary school algebra skills. Math worksheets on pre - algebra for children from 3rd to 7th grades. Some sub - topics covered include: algebraic expressions, pre - algebra addition, subtraction & division equations, linear equations, linear inequalities etc. Teachers and parents can use these resources as tests in classrooms or extra homework material. Practice Pre algebra adition with this worksheet. Practice Pre algebra division decimals with this worksheet. Practice Pre algebra multiplication addition with this worksheet. Practice Pre algebra subtraction 1 with this worksheet. Practice Number problems with this worksheet. Practice Linear inequalities with this worksheet.